It’s important to take great care when considering whether or not bariatric surgery is for you. By understanding all of the factors involved with surgery, you can make the most informed decision for your particular health. 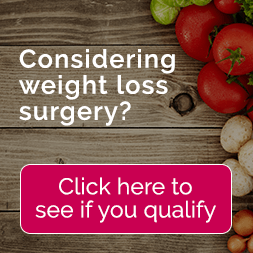 What Types of Weight Loss Surgery Procedures Are Available? The type of bariatric surgery used to treat obesity or morbid obesity depends on a variety of factors. However, some of the most popular surgery options include Roux-en-Y gastric bypass, gastric sleeve, gastric banding, and biliopancreatic diversion. Gastric bypass surgery separates the stomach into two parts with less than 5% of the original stomach remaining. Gastric banding is a surgical procedure where the stomach has an inflatable band installed that restricts food intake. Gastric sleeve surgery removes about 85% of the stomach and leaves the rest in the shape of a sleeve to manipulate digestion. Lastly, biliopancreatic diversion is used to create a smaller stomach that absorbs less food. Typically candidate requirement depends on the type of surgery and the facility, however, most weight loss surgery requires a body mass index (BMI) of between 35-45 with obesity-related medical conditions. These comorbidities include (and are not limited to) high blood pressure, arthritis, obstructive sleep apnea, Type II Diabetes and heart disease. Most candidates need to lose more than 100 pounds and have failed to lose weight on their own. What can weight loss surgery do for me? For obese individuals, bariatric surgery can save lives. Losing excess weight has been proven to reduce the risk of stroke, heart attack, cancer, and diabetes. What are some complications or side effects associated with bariatric surgery? Regardless of the bariatric surgical procedure administered, there are risks or complications associated with each particular surgery. Some complications include infection, blood clots and vitamin deficiencies, which can lead to diarrhea, anemia and kidney stones. However minimally-invasive laparoscopic procedures are less likely to lead to infection than that of open surgeries. Whether or not the surgery can be reversed depends on the procedure itself. For gastric banding, the procedure can be reversed because no part of the intestines or stomach was removed and a band was placed around the stomach. However, gastric bypass and gastric sleeve surgeries are not reversible. Insurance coverage depends on the company, the specifics of a patient’s policy and the health issues caused by the obesity itself. Medicare will pay for weight loss surgery. Contact your insurance company specifically to determine your eligibility. Ultimately the amount of weight loss will vary with each patient and will depend on the surgery type they choose. However, according to the Cleveland Clinic, most patients can expect to lose between 66-80% of their excess body weight in 18 to 24 months post-surgery. What is the recovery time associated with weight loss surgery? Recovery time also depends on the procedure as well as if a laparoscopic approach is taken. Laparoscopic surgery has a faster recovery time and a lower risk of complications. Hospital stays vary as well. Are there any dietary restrictions after weight loss surgery? After weight loss surgery, patients must follow a strict diet that lasts for 1-2 months. This is important in order to allow the body to heal and to learn how to digest food again (and with their new routing system). A dietician will work with patients to plan healthy and appropriate meals for them throughout their recovery. How long will I have to wait to get pregnant after surgery? Most medical professionals recommend that a woman waits at least a year following surgery before getting pregnant. This will depend on the amount of weight that needs to be lost. This is a time period where they feel that the body will be more stable and can carry a baby to full term in a healthy manner. Ultimately these 10 things are just some of the many things you should research before deciding whether or not weight loss surgery is for you. The more you prepare yourself for the process, the easier it will seem as you endure it. Good luck!